Get your cameras ready -- the time for taking pictures of the 途eal Japan,・ complete with young women dressed in sumptuous, traditional kimonos, is upon us. Sunday is the day that Seijin no Hi (Coming-of-Age Day), which marks the official entry to adulthood for young Japanese, is observed in most cities. It is also a perfect day for people to see and take pictures of large numbers of women attired in Japan痴 elegant national dress, the kimono. Although it has evolved down through the ages, the kimono was originally derived from a seventh-century robe adopted from northern China by the Japanese court. However, the kimono of today gives little hint of the many transformations it has undergone, from the multi-layered, wide-sleeved, trailing robes in a profusion of color seen in Heian times (ninth to 12th centuries) to garments proclaiming the freedom of artistic expression made possible by the discovery of the yuuzen dying process in the Edo period (1600-1868) to the addition of foreign touches during the Meiji Restoration at the end of the 19th century, reflecting Japan痴 newfound desire for Westernization. The kimono in its current form was originally worn by the ex-samurai elite who ruled Japan after the fall of the Tokugawa Shogunate in 1868, although the designation 徒imono,・meaning 鍍hings to wear,・was not used in Japan until it became necessary to distinguish the long-sleeved, open-fronted native garment from the Western-style apparel that was quickly gaining in popularity. Unlike Western clothing, the emphasis in kimono is not on shape, which never changes, but rather on color, pattern and decorative detail, which do vary according to the time of year, the age of the wearer and the degree of formality of the occasion. In fact, seasonality plays a major role in the determination of exactly which kimono to wear and when, from those with lining (awase) in spring, fall and winter and those without (hitoe) during the warm summer months, to fabric -- satin in spring, gauze in summer, crepe in autumn and damask in fall. Kimono color also reflects the seasons: cool and pale for spring, light in summer, warm and dark during autumn and bright in winter. Permissible motifs as well are seasonal, moving from cherry blossoms to clematis to persimmon to pine/bamboo/plum as the year progresses. The kimono a woman wears is usually an accurate indicator of her age. Vibrant colors such as pinks, blues and greens are reserved for young, unmarried women, as are the elaborate floral motifs that extend the entire length of their brilliant kimonos. Unwritten but strictly-adhered-to rules dictate that the older a woman gets, the more conservative and subdued her kimono must become. As a matter of fact, as a woman ages, her kimono changes in subtle but noticeable ways: The colors darken; the designs drop further away from the waist and are confined closer to the hem; the V-shaped overlap in front deepens in position; the obi, or wide belt holding the kimono in place, and its accessories are worn lower on the body, and the nape of the neck is allowed to be more fully exposed. 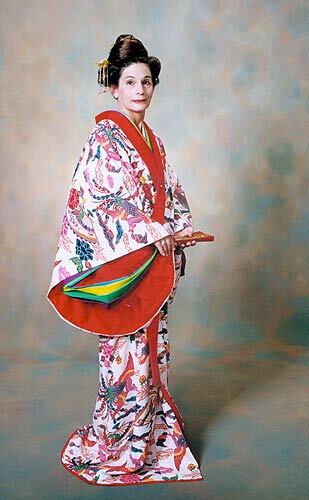 The length of a kimono痴 sleeves is also an indicator of the wearer痴 age: Only young, single women are permitted to dress up in a style of kimono called furisode, characterized not only by their lively colors and fanciful designs but also by their long, wide sleeves, which sometimes reach to the ground. This is the kind of kimono that will be most in evidence on Seijin no Hi. More mature ladies must don kimono distinguished by truncated sleeves, muted colors and relatively conservative decoration. As anyone visiting Japan has noticed, kimonos no longer serve as everyday wear but instead are reserved for special occasions, normally those that celebrate crucial points in the life cycle such as birth, marriage and death. Other milestones that call for the wearing of kimono include school entrance and graduation, the start of service with a company, retirement ceremonies, New Year痴 Day and Seijin no Hi. Traditional Japanese pursuits, such as tea ceremony, flower arranging, classic theater, dance and music may also be appropriate for kimono-wearing. Within this framework of occasion exists a hierarchy of formality that is expressed in every aspect of a kimono, including its color, fabric, design pattern and placement, and the number of family crests displayed as well as in the obi, footwear and accessories accentuating the garment. The often-quoted reason for the disappearance of the kimono in daily life has been the inconvenience and discomfort imposed by its physical shape: a narrow skirt making it hard to walk; a constricting obi that prevents overeating, or sometimes any eating; and dangling sleeves that constantly get in the way. However, another factor contributing to the kimono痴 lack of popularity is that of economics: Buying a good-quality kimono and all its accouterments can run as much as $7,000, with the ordering of a top-quality garment, from the white bolt of silk in the beginning to the dyed, painted and embroidered masterpiece at the end -- more like commissioning a work of art than purchasing a thing to wear -- being prohibitive for all but the well off. Even the rental of a kimono, as many families do on Seijin no Hi and for weddings, can run from $250 to $1,500 for a day, But while the high prices discourage many women from buying kimono, ironically the exorbitant expense represents the important cultural value accorded kimono. Says anthropologist Lisa Dalby in her book 適imono,・women are seeking to buy an image of cultural respectability; buying it too cheaply would only serve to tarnish the image. Although kimonos are standardized all over Japan, Okinawa boasts its own particular style handed down from the days of the Ryukyu Kingdom, which flourished from the 15th century until 1879. Similar in basic shape to traditional Japanese kimono, the Okinawan version is not always bound with a wide and uncomfortable obi like its mainland cousin, and a style harking back to the Ryukyu era can have a pleated underskirt visible beneath its hem. Textiles also vary significantly from those of Japanese kimono: In place of the highly stylized floral designs gracing monochrome silks and wools, Okinawan garments are made from indigenously woven and dyed fabrics such as Miyako-jofu (hemp), Kumejima-gasuri (silk) and Yomitan hana-ori (cotton), all of which often feature geometric patterns, as well as the colorfully stenciled bingata. These loose-weave fabrics and the island痴 unique open-sleeve design are far more appropriate for Okinawa痴 hot and steamy southern climate. As Dalby so aptly describes the kimono, 的n its fabric is expressed the Japanese aesthetic sensibility to season and color; in its folds is layered the soul of Japan.・So grab a camera and head for one of the island痴 temples or shrines, such as Futenma-gu on Highway 330, on Sunday and be prepared for a feast for the eyes (and the lens) as well as the soul.